County-level annual damages in median scenario for climate during 2080-2099 under a business-as-usual emissions trajectory (RCP8.5). Negative damages indicate benefits. Climate change is a global problem with extremely local impacts. 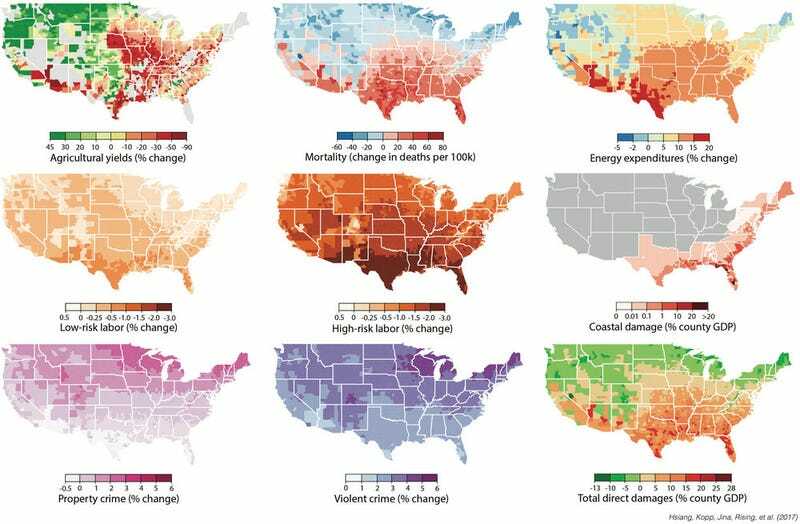 A major new study illuminates how the effects of climate change will reverberate economically across the United States. Its findings are both a warning of challenges to come and an opportunity to recalibrate how resources are allocated to protect Americans from global warming’s negative repercussions. County-level annual damages in median scenario for climate during 2080-2099 under business-as-usual emissions trajectory (RCP8.5). Negative damages indicate economic benefits. The team of economists and climate scientists looked at how six categories—agriculture, crime, health (mortality), energy demand, labor, and coastal communities—will be impacted by higher temperatures, changing rainfall, rising seas, and intensifying hurricanes. They found that states that are already hotter, and already poorer on average, will lose the most. These states tend to be located in the South and lower Midwest. Meanwhile, states to the north and west will see increased economic opportunity, with “colder and richer” counties across the northern border and in the Rockies standing to benefit the most as health, agriculture, and energy costs are likely to improve. The study is the first to price warming by analyzing decades-worth of data and evidence. The researchers estimate that for each one degree Fahrenheit (0.55°C) increase in global temperatures, the U.S. economy loses about 0.7% of Gross Domestic Product, with each new degree of warming costing more than the last. Amir Jina, a postdoctoral scholar in the department of economics at the University of Chicago and another co-leader of the study, told Project Earth he was very surprised by the extent of the damages being forecast. Range of economic damages per year for groupings of US counties, based on their income (29,000 simulations for each of 3,143 counties). The poorest 10% of counties are the leftmost box plot. The richest 10% are the rightmost box plot. Damages are fraction of county income. White lines are median estimates, boxes show the inner 66% of possible outcomes, outer whiskers are inner 90% of possible outcomes. People in the South stand to lose a lot more to climate change than those in the North in part because of temperature thresholds. The effects of temperature on different economic sectors are non-linear: the higher the temperature, the higher the damages. Of the impacts studied, increased mortality will be the greatest direct economic cost from climate change, accounting for about two-thirds of the costs seen by the end of the century according to the study and using mortality values consistent with current U.S. government practices. Jina said this data could help inform how health care investments in infrastructure and other spending are distributed, as they will be needed more in some areas than others to offset the increased risks of climate change. For instance, the study found that warming reduces mortality in cold northern counties and elevates it in hot southern counties. Jina hopes the study will help inform researchers and policymakers working to integrate the Social Cost of Carbon, a measurement of how rising CO2 emissions affect human welfare, into economic planning. He said he views the lack of such a cost right now to be a “huge distortion in the market” as even though we know CO2 emissions are causing damages, the cost of releasing them into the atmosphere is artificially set at zero. In March, as part of a broad executive order on energy, President Trump disbanded a federal social cost of carbon working group started by Obama. Trump stopped short of abandoning the SCC altogether, but rewrote the rules so that agencies can employ an SCC value that approaches zero. In reality, the SCC should be rising every year to reflect the increasing costs of unmitigated climate change. The Trump administration is literally changing the math to get the answer they desire to make fossil fuels look better. Amir and others working in the intersection of climate change and the economy have started a group called the Climate Impact Lab. The team hopes to broaden the work of this study to a global scale and to calculate a social cost of carbon with as much real-world evidence as possible—perhaps for use by other government entities or future administrations. D.J. Rasmussen, a co-author on the study and a PhD student at Princeton, told Project Earth that the detailed county-by-county analysis is in-depth enough to help decision makers at state and local levels estimate how climate change could impact their economies. While the study paints one of the most detailed pictures of the winners and losers from the impacts of climate change in the U.S., Rasmussen cautioned that it’s far from complete, and that many other impacts still need to be studied.